We both had ‘Frustuck fur Helden’ – that’s breakfast for heroes. It was meaty, cheesy and eggy with NO JAM! New resolution: always get two different breakfasts to ensure variety. I need jam in my breakfast. There is an election coming up here and campaign posters are everywhere. All the candidates look really eager and trustworthy, except for one named Manfred who had blond hair, blue eyes and very white teeth. They have the Pirate Party here too – this is a progressive party that advocates for internet freedom among other things. 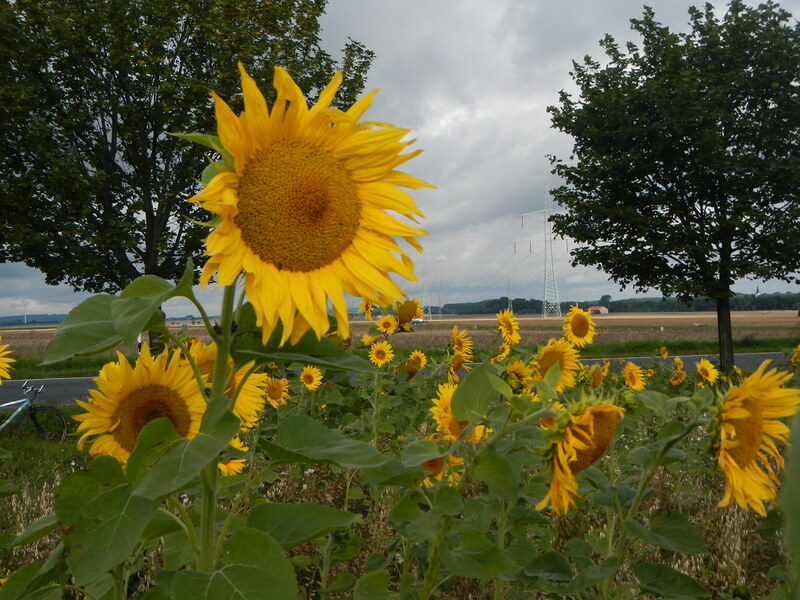 In our rural meanderings of this morning we saw solar farms (there are plenty of these in Germany despite there being less space and less sun than in Australia), wind farms, sunflowers, whistling kites flying overhead and avenues of fruit trees along country roads. I tasted a plum from one of the trees and now know why they invented Pflaumenkuchen! We are in Ampelmann territory – it’s nice to see this cheery fellow at the traffic lights. So far no Ampelfrau – but she does exist. I will keep looking. Lunch was in Erfurt, a large city with an overwhelming quantity of historic everything! There is the massive Erfurt Cathedral and the equally massive St Severus Church right beside each other. Visitors are requested to be calm inside and not take photos with lightning. We came across not one but two busking oboists and reckon they are part of a oboe busking gang. There is a huge pedestrianised city centre with trams gliding quietly through, lots of German tour groups and football hooligans, fortunately in small groups, but already drunk and noisy. It is easy to imagine that in large numbers they would be quite scary. At the railway station there was a heavy police presence with riot gear and dogs, ready for the influx of fans from Dresden. I spoke to one of the polizei and apparently this happens every week in the football season. We took a short train ride to Weimar where the atmosphere is also historic but lacks the football component. This is the city that was home to Goethe, Schiller, JS Bach, Lizst, Hans Christian Andersen and no doubt many other famous people at various times. Kunstfest Weimar (arts festival) is in full swing at the moment. But we are now leaving culture to the local people and sampling a bit of popular culture on German TV! This entry was posted on 23 August 2014 at 7:14 pm and is filed under Europe 2014. You can follow any responses to this entry through the RSS 2.0 feed. You can leave a response, or trackback from your own site. Ampelfrau = Angelfrau – Angela Merckel really is running the country! I am proud to be associated with two heroes!